Believe it or not, when we sat down, it was an empty table. The relationship between a Korean main dish and banchan is similar to that of a hamburger with French fries, yet it's an even tighter bond. 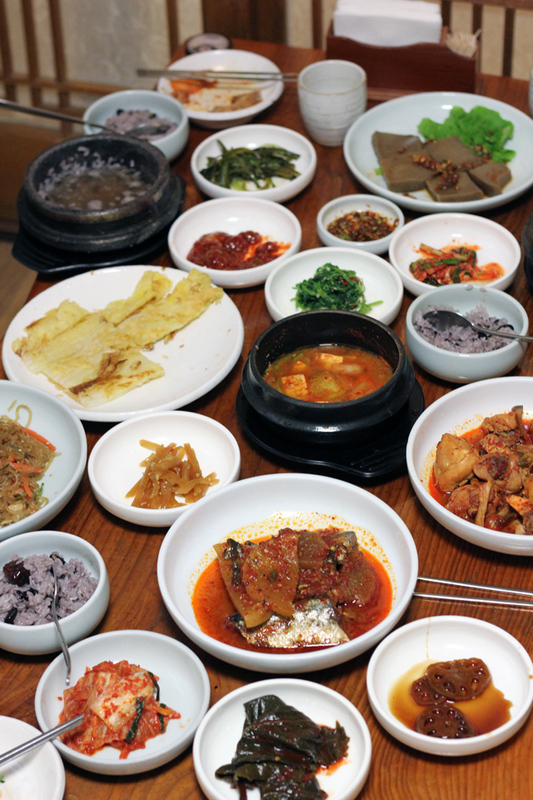 The most common banchan is Korea's omnipresent chili pickled napa cabbage known as kimchi, but there are also hundreds of other items. On a lovely Saturday, fellow bloggers Nomadic Samuel, That Backpacker and I met up in central Seoul for a Korean feast of epic proportions. We hunted through the narrow alleyways of Insadong (not far from Bukchon Hanok village) before finally settling on a homey looking restaurant tucked away from the main walking street. Our goal was to find a Korean “set menu lunch” which can be described as nothing less than a surprise meal that includes probably the same dishes the restaurant owner's family is eating. It's really a meal that's composed of whatever happens to be on hand – a home cooked feast at a restaurant. Taking off our shoes and leaving them at the doorway, we entered and took seats at a traditional table about a foot off the ground. 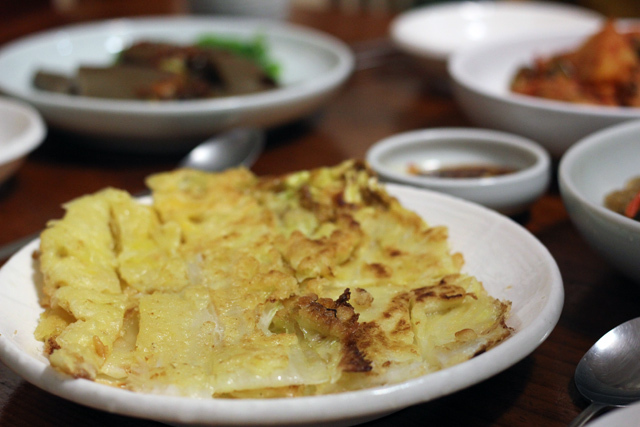 The first thing that arrived to the table was a wonderful Korean style pancake filled with veggies and fried to a crisp. Dipped in a soy vinegar sauce and paired with a bite of kimchi, it was an extraordinary way to begin the meal. 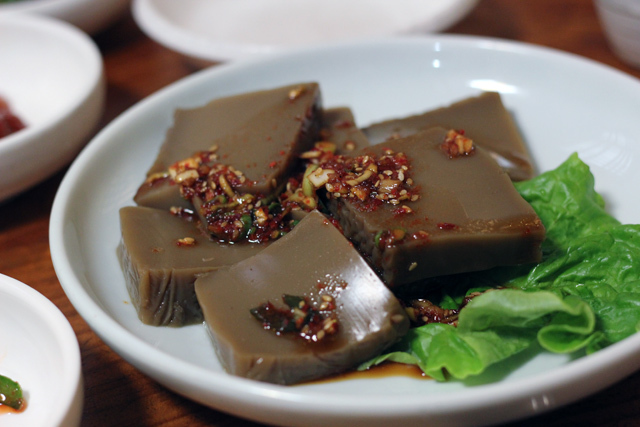 Gelatinous Squares topped with chili sauce! These gelatinous squares tasted almost like earthy jello. They were served cool in temperature, and had it not been for the outstanding chili garlic sauce they were doused in, they would have actually been quite plain. Luckily the combination was spectacular and oddly addictive (must have been that sauce). 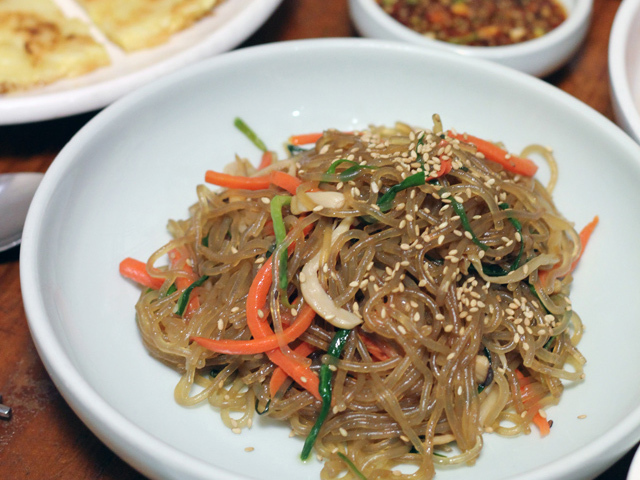 Japchae is a very typical South korean dish made from stir fried translucent sweet potato noodles. The noodles were combined with a number of other ingredients like carrots, mushrooms and green onions. Slighty chewy and wonderfully fragrant with sesame oil, japchae made a great addition to the feast. When we thought there was no possible way to add more food to the table, the smiling waitress came with yet another few dishes to serve. This dish was a chicken and potato stew that almost reminded me of a Thai curry minus the coconut milk. 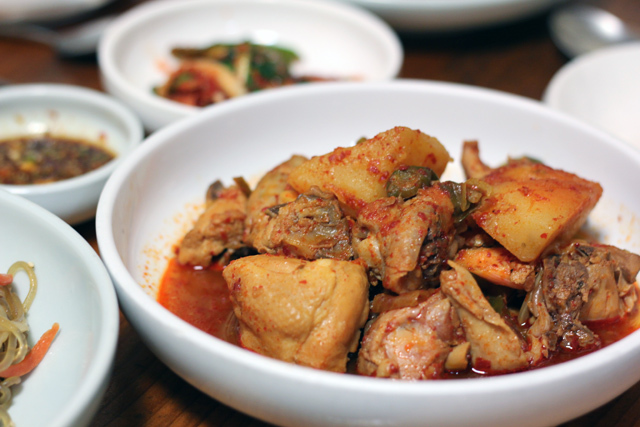 Tender chicken, soft potatoes and a hint of sweet kimchi were the notable aspects of this true comfort food. I'm a serious rice eater, sure I love dishes of any kind solo as well, but no matter what cuisine I'm eating, everything just tastes better to me with rice. Making a mistake, I decided to ask for rice, only to find out it was still on its way! 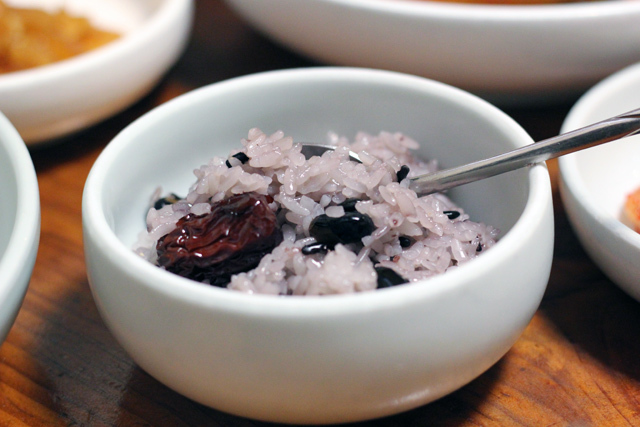 It was no ordinary plain steamed rice but instead it was medium grain Korean rice mixed with beans, Chinese plums and ushered to our table in sizzling earthenware pots. After mixing the rice and putting it into a fresh bowl, hot water was poured into the eathenware (that included crunchy pieces of scorched rice) to create a soothing soup. Though we ate at a mainstream restaurant, it honestly felt more like we were the guests of honor at a local Korean's home. The food was exceptional, the diversity of flavors was exciting, and the satisfaction of the entire meal was invaluable. That was so much fun Mark! I hope we all get a chance to all feast together many times again! Yes Samuel, there will be more feasts in the future! Looks like a wonderful spread. I could leave the jello squares though! Those jello squares were the most peculiar item on the table, a very interested texture to go with the meal! I think those jello squares are made from potatoes, but I’m not positive about that. One thing not mentioned was that this meal was probably very inexpensive as well. I remember whenever we went out to dinner, we usually paid about US $10 each for a meal with a few beers.